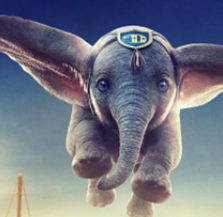 Disney’s live-action remake of Dumbo made it out of the circus tent this weekend with a far from spectacular $45 million launch. Coming 78 years after the classic cartoon feature’s 1941 release, Tim Burton’s version is perhaps even more kid-friendly than the original, doing without thing’s like the young elephant’s psychedelic drinking experience and the not so subtly racist jive speaking Jim Crow crows. This modern version follows more or less the same storyline as the old one, with the titular big eared flying elephant striving for acceptance and trying to gain his freedom from an exploitative circus owner, played this time by Danny DeVito. Joining him in the cast are Michael Keaton, Colin Farrell, Eva Green, and Alan Arkin. Reviews have been mixed to negative, while an A- Cinemascore from its expectedly young audience could bring about stable earnings for the rest of its run. First showings overseas were middling as well with Dumbo earning $71 million in 53 foreign territories. China is its biggest foreign market at $10.7 million and Mexico had a strong opening with $7.2 million. It scored notable number one finishes in major markets France, Russia, and the UK, as well as France and Italy. Despite its relative underperformance and lukewarm critical reception, Dumbo‘s combined $116 million global launch is the second best of the year, behind Disney’s own Captain Marvel. Universal meanwhile continues to rake it in with Us having earned $33.6 million at home this weekend, in second place, as well as $22.6 million abroad. Overseas numbers jumped up over the last frame with the addition of 14 new markets including South Korea where it made $6.9 million. It took $2.7 million from its opening in Australia, and $1.4 million in Russia. Global sales for Us are now at $174.5 million, split $128.2 million domestic and $46.3 million foreign. Italy will be its next biggest release while horror happy Mexico opens May 3, on the Friday of what should be a big Cinco de Mayo weekend. Director Jordan Peele’s personal benchmark of $225 million from Get Out is still a ways off but should be within reach for Us. Speaking of benchmarks, Captain Marvel is flirting with the ten-figure club and will pass the billion-dollar threshold by Tuesday at the latest. A fourth weekend in US theaters saw the Brie Larson led picture to earn $20.5 million in third place and reach a domestic cume of $353.8 million. Overseas plays were worth $46.8 million and brought the films global earnings to $990.6 million. With Avengers: Endgame opening in a few weeks and Star Wars: Episode IX coming out in December 2019 is shaping up to be a massive year for Disney. That looks like a record-breaking lineup, even before considering their new Fox acquisitions that include two X-Men films among a handful of promising others. One the more independent side, Harmony Korine’s The Beach Bum, from young distributor Neon, had a soft opening of $1.8 million from 1,100 theaters. Beach Bum gained a lot of attention in early marketing stages for its stoner antics and outlandish castings of Matthew McConaughey, Isla Fisher, and Snoop Dogg, but a lot of that enthusiasm seems to have died out. Reviews have been fairly negative across the board. With a budget of just $5 million, there is, however, still hope that VOD and streaming can turn it profitable. Next weekend superhero farce Shazam! opens in US theaters, along with Pet Sematary.